Subnotic, a new events and promotion agency in Chiang Mai, made their debut in trying to make dreams come true. The event team directors Ulrike Kneitschel and Anong Neuhaus dedicated the event to assisting the three children’s charities comprising of the regional Juvenile Training Center 7, a center for mentally retarded children; the ‘School for Life’ where 20 percent of the 170 children in the small elementary school are AIDS orphans; and the Foundation for Disabled Children in Thailand. The event was held at Chiang Mai University Convention Hall which was prepared for hundreds of guests, VIPs, sponsors, helpers, organizers and observers. Two lovely MC’s reminded the audience that all people in this world have dreams, in particular children, but not all can make their dreams come true. It may be due to poor standard of living, disability, poverty, home environment, disease, or lack of educational opportunities. This was why the event had been proposed, to help some children’s dreams come true, through assistance to the three charities. 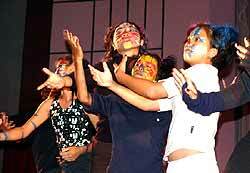 The concept was that nothing would be better than watching children themselves, to open the hearts of people. The huge entertainment program was complemented by a Fashion Show, a Laser Show, a Magic Show and a variety show with over 80 performers from schools in and around the North. Music included traditional Lanna, as well as German Folk songs and ‘Lunatic’, a Thai Rock Band. Something for everybody, accompanied by a delicious Gala Dinner from Amari Rincome Hotel. The Grand Finale brought us excerpts from the Nutcracker Ballet, most joyfully performed by local ballerinas, both large and small. 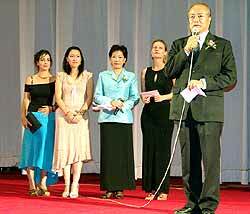 It was a most ambitious program, which was unfortunately not well attended. Keeping in mind that this was the first major event for the organizers in Chiang Mai, the ideas behind it were very commendable, and the causes are undoubtedly worthy. For future events one can only wish that more people get to know about it in advance, so that more funds can be raised, as after all the kids, and their futures, will benefit from it. A great thank you must also go the sponsors, who entrusted the organizers with funding and other support. 6-year-old Yanisa Kasemjit (Kam), an instructor in Thai Dancing class at Wat Koay Sing School danced ‘Withee Kon Muang’ which reflects Chiang Mai’s culture and art. 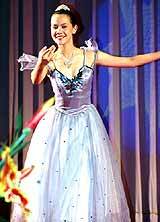 One of the “flowers” in the show performed by Chiangmai Ballet Academy ballerinas who danced in the show ‘In my Dreams’ where a dreaming girl is brought to a wonderland by her guardian angel. (From left) The two lovely MC’s Sara Kessel and Natcha Tiyaworabun, ML Preeyapun Sridhavat, Subnotic director Ulrike Kneitschel and Cherdkiat Chaiyaman from the regional Juvenile Training Center 7. Patchara is a 20-year-old student at the String Department, Payap University, playing the 2000-year-old Chinese Harp. Luc Masschelein, director of the FDC gave a heart-warming speech explaining the urgent need of funds to help disabled and mentally retarded children. Some of the small CDSC Choir members. Birds, butterflies and flowers should be the things every child is able to dream of and be blessed with a happy life. 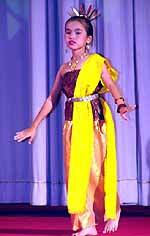 ‘Aieng Sae’ traditional Lanna dancing about an unlucky girl who finally finds the only truth is life as ‘Aieng Sae’ (a type of Thai flower). Let this evening be a fairytale for disadvantaged children and may the lucky fairy (Nan) bring flowers and love for the underprivileged! 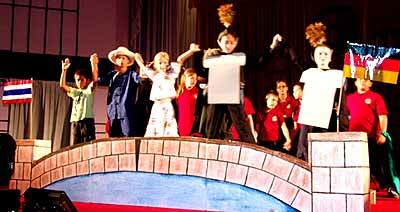 ‘Cats’ performed by children from the ‘School of Life’. Mostly AIDS orphans and children in situations of extreme need being given a secure existence and a life worth living. Involved in making a dream come true were (from left) Jens Kronberg (fund raising coordinator, School for Life), Luc Masschelein (director of the Foundation for Disabled Children in Thailand), Cherdkiat Chaiyaman (director, Regional Juvenile Training Center 7, Dept. of Juvenile Observation and Protection), Dr. Jao Duan Dueng na Chiang Mai, Katsuhiro Shinohara (consul general of Japan), ML Preeyapun Sridhavat (vice president ‘Secret of Dreams, director Chiangmai Ballet Academy). 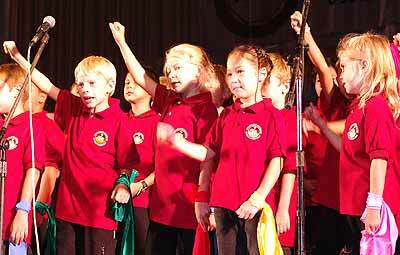 The A Capella choir from Prem Tinsulanonda International School. A bridge of love, a united world, and children of the world are the future. War and hate should be the past. This was one of the messages of the CDSC. Let us build a bridge! Together we will save the world. The strong CDSC Choir. Gong Dee Studios presented a Tap, Latin, Flamenco, Ballet, Lanna contemporary and Asian contemporary Dance Festival with all proceeds going to a school for blind people in Chiang Mai on June 6. It started with the story of a young ballet dancer on the way to reach her dream with Australian Dance teacher Sharon Martin releasing the feelings of a woman who knows that she has to make way for the younger generation. 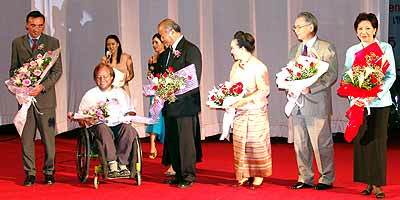 Very touching, very professional and first class entertainment but when Waewdao Sirisook, an artist from the dramatic arts department took over the stage, it released a little of the tension which had built while Sharon Martin and Toyah Sinclair were performing. 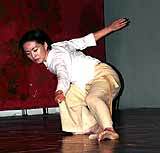 The respite from tension was short as Flamenco was next and whoever has seen Supreeda Wongsansee before knows of her expertise in Flamenco having trained, performed and choreographed for many productions including the Bangkok City Ballet and has performed at various Royal family festivals. The program included a Latin Dance Live Show with the only man of the whole afternoon, Peerapong Pongpaiboon, a Ballroom Dancing teacher at the Chiangmai Ballet Academy. 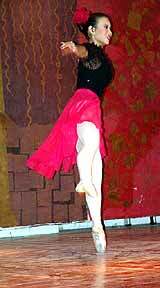 He performed a Cuban Rumba with lovely Kamonwan Yamniam, a Cha Cha Cha with Tabhita Oettle and when his Jive team spiced up the Dance floor he showed off with two girls at the same time. It was an afternoon well spent and one can only wish that there will be many more chances to watch entertainment like this and ‘make merit’ at the same time. Thank you Khun Vichit Chaiwong for once again letting your studio be the meeting point for eastern and western culture that peaceful environment. It was not a difficult decision to join a survey trip to Laos and Cambodia, after the invitation from Vilay Phiahouapanh, managing director from Lao Youth Travel in Vientiane. To meet the party on June 20 in Vientiane, I opted for a twelve hour bus ride from Arcade Bus station in Chiang Mai by Chakrapong Tour to Udon Thani for 410 baht, including a small midnight meal somewhere near Phitsanulok. A stone carving of the three Hindu gods at Wat Pu temple. Arriving early in the morning, there was a local bus to Nong Khai for another 20 baht, and another 20 baht to the Friendship Bridge. At the international border point at the Friendship Bridge, there is a visa on arrival service. It is necessary to bring a passport photo and USD 30 in cash to pay the visa fee that allows you 15 days into Laos. If you wish to pay in baht, the friendly Lao immigration officials charge you 1,500 baht (USD 37) instead. 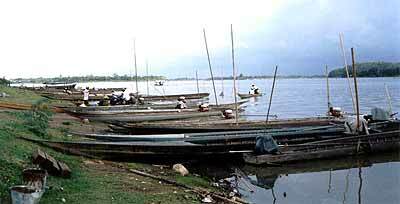 Laotian transport boats at the Lao Cambodian border waiting for customers. On the Lao side of the bridge, luckily there is a minibus service to bring you for a fee of 100 baht to your destination in downtown Vientiane. I headed straight to the office of Lao Youth Travel at Fa Ngum Quai, conveniently located near the bank of the mighty Mekong River. There, Vilay suggested a two night excursion tour to his hometown in Vang Vieng. 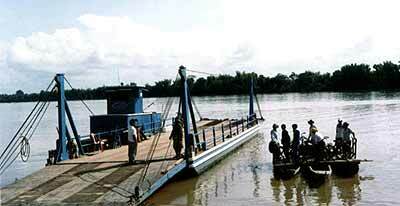 One of the many ferry boats on the Mekong in southern Laos. Situated 170 kilometers north from Vientiane, on Road 13 leading to Luang Prabang and up to the Chinese border, Vang Viang is a charming district town along the Nam Song River with many facilities catering for backpackers. The environment comprises bizarre looking limestone hills with a few caves worth visiting. A floating restaurant at Don Khong Island during poor weather conditions. There are different categories of accommodation, ranging from the up-market Nam Song Hotel to the very basic but lovely Si Sombat Guesthouse near the bus station. At the local Sunset Restaurant, we had a lively dinner attended by the vice-governor, Chanhpeang Douangphachanh and Soumontha Youtitham, a community awareness expert, who is working for the Ministry of Communication, Transport, Post and Construction. 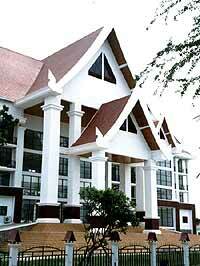 Almost like a palace - the new Mekong River Commission building in Vientiane. Back in Vientiane, I was guest of Christopher Yeo, director of finance and administration in the Novotel Vientiane. The next two days, I eagerly explored the emerging “Golden Mile” along the Mekong River and inspected the new building of the Mekong River Commission. 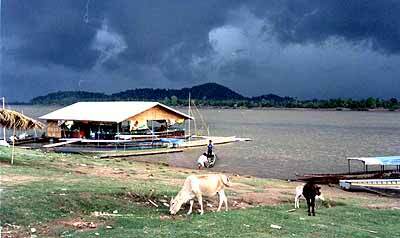 The Mekong River Commission will move from Phnom Penh to Vientiane at the end of 2004. Another milestone in Vientiane is a highly sophisticated entertainment complex named “Green View” at the outskirts of town. On the eve of May 24, we took the best bus of the Kriangkrai V.I.P. Transport Company to Pakse in the south of Laos for 600 baht. The luxurious bus left the Wat Si Muang Bus Station at 8.30 p.m. and stopped in Thakhek at 1 a.m. After passing the town of Savannakhet, we reached Pakse at 6 a.m., leaving some rain behind us. Welcomed by the local staff of Lao Youth Travel, we proceeded to the Champa Residence Hotel to refresh our body and mind with a kind of French breakfast and taste of the real Laos coffee. Situated 675 kilometers from Vientiane, Pakse is the capital of Champasak Province and commercial center of the developing zone of the “Emerald Triangle” in the border area of Laos, Cambodia and Thailand. The old town of Champasak is just about one hour drive south of Pakse and was the seat of an independent kingdom. To reach this (nowadays) very sleepy place, we had to take a ferry across the Mekong River and continue another eight kilometers to Wat Phu, a UNESCO world heritage site since last year. It is the origin of the Khmer civilization, a long time before Angkor. Originally a holy Hindu shrine and only relatively lately transformed into a Buddhist temple. 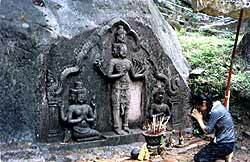 There are still interesting stone carvings of Brahma, Shiva and Vishnu there. Back at the ferry point across the Mekong River, we had our first local lunch and after another two hours drive in the afternoon we reached Don Khong Island in the pristine area of the 4,000 Islands (Si Phan Don), where we stayed at the pleasant Villa Muong Khong. At sunrise the next morning, we departed from Don Khong Island, the hometown of the present president of Lao PDR H.E. Khamtai Siphandone, to visit Khon Phapheng Waterfall, which is 1 kilometer wide and with a fall of 15 meters - a natural obstacle to any river transport. There are still vestiges of the colonial French railway line to bypass the waterfall. Finally, we reached Veun Kham, where some freshwater dolphins abound and across the river is the border post of Dong Crorlor in Cambodia. After 835 kilometers from Vientiane on Road 13 we were on the southernmost point of Laos and ready for entry into the Kingdom of Cambodia with a visa supplied by any Cambodian embassy abroad.